Investigate the remarkable political career of Billy Hughes and the major historical events he took part in, here in Australia and overseas. Resources include election badges, biographies and a website Billy Hughes at War. Would you vote for this face? Billy Hughes represented Australia at important international meetings such as the Paris Peace Conference in 1919. What was this meeting about, and what was Hughes trying to achieve for Australia? Why do you think Hughes wanted Australia to be involved on the international stage? What does this show about changes in Australians’ perceptions of themselves after the First World War? During his time in parliament, Billy Hughes was involved in many controversial pieces of legislation. Discuss in groups, or organise a class debate in relation to one of these issues. For example, the introduction of the War Precautions Act 1914, or the 1916 and 1917 conscription plebiscites. Write a brief reflection from Hughes’ perspective on his 90th birthday, setting out the aspects of his political career that he was most proud of, and any regrets. Include references to the political and social changes experienced in Australia during his long period in public life. 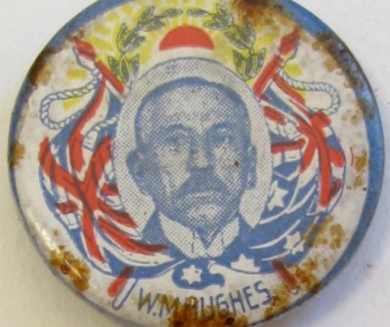 This badge is one of the objects relating to Billy Hughes in the Museum of Australian Democracy’s collection. Unlike parliamentarians today, Billy Hughes changed his membership of political parties frequently. Make an election campaign badge or advertisement for yourself. You could include symbols which represent you and the things you would campaign on. You could also incorporate the name of your own political party on your badge.